Joshua Bishop, a third-year environmental science major at the University of Maine at Farmington, digs through a bag of garbage looking for recyclables today. FARMINGTON - The scene on the green today at the University of Maine at Farmington was all about finding things that were thrown away that should have been recycled. The annual event was expanded further this year to include a new program that also generates support for local charities. 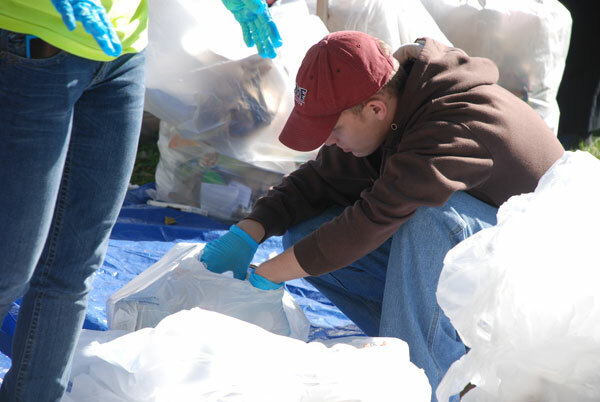 At the event sponsored by the UMF Sustainable Campus Coalition, trash generated in residence halls over a 24-hour period are collected to determine how much could have also been recycled. The coalition has been working with the Sandy River Recycling Association to pull items for recycling at the transfer station and, at the same time, items for possible use by Everyone's Resource Depot on campus. ERD, a non-profit organization, takes recycled goods and offers them for creative reuse, such as art projects and various teaching tools. A nominal fee is charged to support the program. Another new recycling effort at UMF was added last spring. Items like chip and candy wrappers, solo plastic cups and shampoo bottles are collected and sent to TerraCycle, which turns them into usable products like backpacks and park benches. In turn, TerraCycle pays 1 or 2 cents per item, with all profits coming back to UMF going to the local United Way. Since the program began, $215 has been raised for United Way of the Tri Valley's charitable agencies and organizations it supports. 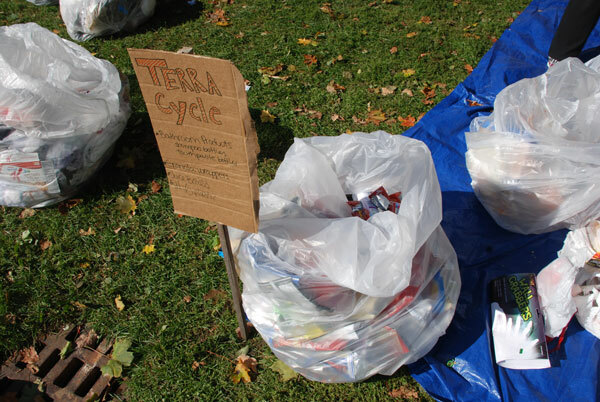 Sarah Martin, an adjunct professor in the Department of Community Health and Recreation, came up with the idea of UMF students working with TerraCycle to not only expand the recycling effort on campus, but to also benefit a local charity. UMF student Joe Dignam, a third-year environmental policy and planning major, is an intern working with Martin and United Way's executive director, Lisa Laflin to coordinate the program. "When I heard about TerraCycle, I thought, wow, we have to do this," Martin said. The students and faculty sorting trash today found all kinds of recyclable items that were pulled and resorted into categories that will be sent to ERD, the transfer station and there was a good-sized bag that will go to TerraCycle. "We want to see the percentage of items that could have been recycled," said Luke Kellett, who is UMF's part-time sustainability coordinator and lecturer in the Department of Sociology and Anthropology. 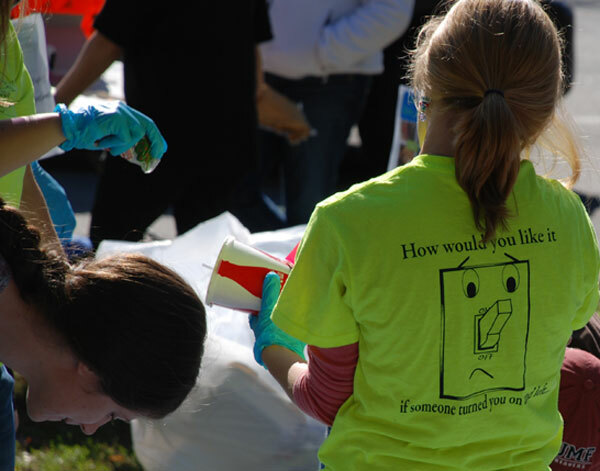 At last year's event they found that 25 percent of the trash could have been recycled. Displaying the trash for all to see at noontime on the campus green helps bring awareness of the recycling effort to the forefront. "We hope to see progress this year and be below 20 percent," Kellett said. Find out more about TerraCycle here. Find out how you can donate your items to United Way of the Tri Valley Area here. A UMF Sustainable Campus Coalition member T-shirt with a light switch reads "How would you like it if someone turned you on and left" as a reminder to turn off the lights when leaving a room to save energy. Trash thrown away was sorted into types of items to be recycled, including things that will go towards making other products through TerraCycle. Money raised goes to the local United Way. 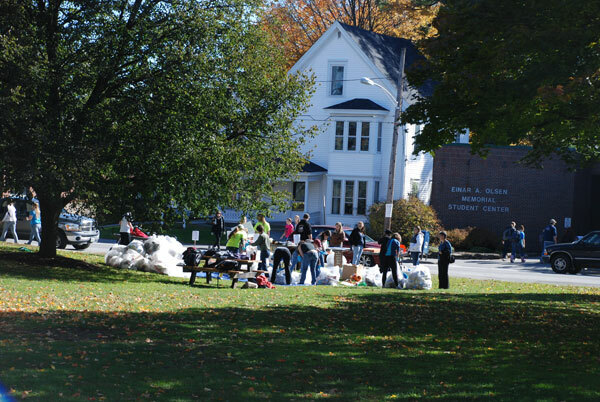 The scene on the green at the University of Maine at Farmington was all about finding items that were thrown away that should have been recycled. Some of those items found in the trash collected can also go towards making products and generating charitable funding. Recycling takes a LOT of time. Few people these days want to "bother". Says a lot for the overall attitude of society. L-A-Z-Y! Maybe they ought to spend more time on having the students pick up all the trash and cigarette butts they leave everywhere on a comical "smoke free campus" Also take a walk inside the buildings on campus sometime and you will wonder if the students even know what a trash can is. Most will need maids when they are out on their own to clean up after them. It used to be that food and drink were not allowed in classrooms. Now each classroom is like a cafeteria, with food and drink everywhere, even allowed during classes. I feel bad for the custodians as they are treated as maids. UMF needs to address the real problem and that is making the students behave in a responsible and respectful manner. No rules for most of these "entitled" students and none are being taught. This is a publicity stunt to put UMF on the front page. My county in MD has been recycling for many years. In our rooms, apts, and housing we put all of our possible recycling items in one container (I use a small laundry basket lined with a trash bag) without sorting. All items of glass, metal, plastic containers and aluminum foil go in this one bag. I put all newspapers and other paper trash into another bag. Cardboard boxes are broken down flat, gathered together and just turn in that way. If I occasionally have a lot of cardboard, then I tie it together with twine for easier carrying. This is how all of our recycling is handled and is then picked up one day a week by trucks used only for recycling items. In turn when they get it to common location other workers separate the glass from metal and plastic and paper and so forth. Seems as though college students and teachers could do this much on their own and then it would take much less time to separate the recyclables and they would not have to go through ALL of the trash. Even in our offices we have one large waste can just for recycling materials in one place and it's used by all the staff. They still have their regular individual small trash can by every desk. Often their individual cans are less than half full at the end of the day! But the common recycling large can is always full each day. Just some ideas I thought might help the efforts you making at UMF. GOOD LUCK!! I get the point, but picking through the trash is just gross! Why not spend their time educating people to recycle in the future. It wil result in a better long term return unless these trash pickers plan on doing this every day. I guess some people can find the negative in every story! To Joe and Sarah- great job starting this up and to benefit the United way is even better. I have started collecting these items at work and I hope this program expands throughout the region. Sure beats degrading plastics in our landfills.